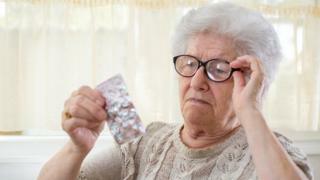 Elderly people in good health should not take an aspirin a day, according to a major study in the US and Australia. There are proven benefits of the drug for people after a heart attack or stroke. But the trial found no benefit for healthy people over the age of 70, and the pills increased the risk of potentially fatal internal bleeding. Experts described the results as very important and cautioned against self-medicating with aspirin. People are prescribed aspirin after a heart attack or stroke because the drug thins the blood and reduces the chances of a repeat attack. Some completely healthy people also choose to take aspirin to reduce their risk and there is continuing research into whether the drug can be used to cut the risk of cancer. However, most research on the benefits of aspirin is performed on people in middle age and there is mounting evidence the dangers increase as we get older. The study was of 19,114 people in the US and Australia in good health, with no history of heart problems and over the age of 70. Half were given a daily low-dose aspirin for five years. Three reports in the New England Journal of Medicine showed the pills did not reduce their risk of heart problems or have any other benefits. They did increase the number of major stomach bleeds. Prof John McNeil, from Monash University, said: “It means millions of healthy older people around the world who are taking low dose aspirin without a medical reason, may be doing so unnecessarily, because the study showed no overall benefit to offset the risk of bleeding. The study also discovered an increase in deaths from cancer, although the researchers think this needs further investigation as it goes against current findings in the field. Prof Peter Rothwell, of Oxford University, a leading expert on the drug, said the findings were definitive. “Taking aspirin if you are otherwise healthy, over the age of 70, if you haven’t had a previous heart attack or stroke, is really of very little benefit,” he said. The findings do not apply to people taking aspirin because of a heart attack or stroke – they should continue to follow their doctor’s advice. And anybody who has been taking low-dose aspirin for a long time is advised not to stop overnight as that may also cause problems. Instead they should discuss any concerns with their GP, says Prof Rothwell.